“You’re perfect,” Sarah (Taylor Schilling) says to her newborn son in The Prodigy, priming the audience for irony. He’s too little yet to evince any real menace, but the birth of baby Miles is intercut with the apprehension of a remote-cabin murderer, a cue that something will soon go amiss with the happy family. For a little while, The Prodigy treats the question of its advertisements (“What’s wrong with Miles?”) as a hanging mystery, rather than the dull inevitability common to so many creepy-kid movies. This one moves forward quickly as Miles grows up, hitting his milestones early under the supervision of two doting parents, and the watchful eye of a suspicious family dog. The movie checks in briefly at infancy, age 2, and age 5, before settling in at age 8, when Miles (played for most of the movie by Jackson Robert Scott, the doomed little brother from It) has been firmly established as, yes, a prodigy, though the movie never really specifies a field in which he’s prodigious. He’s simply in possession of generically unnerving sophistication. But there are warning signs that Miles’ directionless genius may be something more sinister than a developmental difference. He doesn’t play well with other children. He’s prone to creepy staring. At one point, in his sleep, he starts speaking in what turns out to be a rare dialect from the Hungary-Romania border. Eventually, an accident befalls a babysitter. At first, it feels like The Prodigy is preparing to offer bitter comeuppance for the initially excited Sarah, making an example of any parents foolish enough to consider their little ones exceptionally gifted—and pouring salt in the wound by casting Schilling, such a skillful embodier of privilege on Orange Is The New Black. 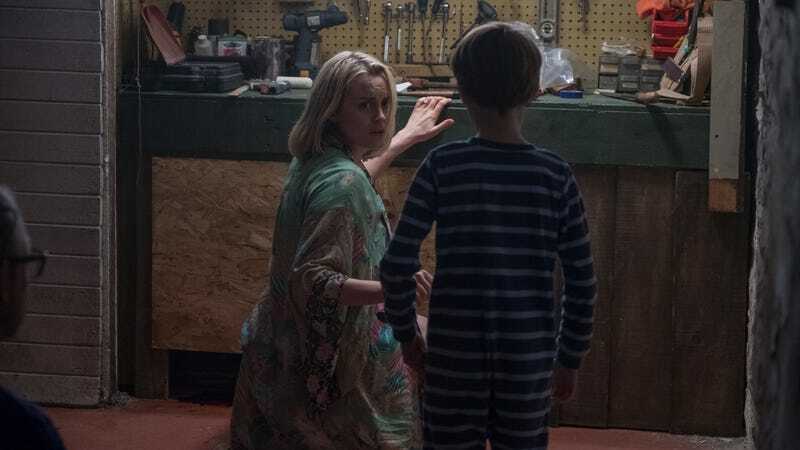 To its credit, the movie is more specific and less spiteful than that, offering a relatively fresh variation on its formula that’s somewhere between demonic-possession horror and bad-seed horror. To reveal the precise nature of what’s wrong with Miles would constitute a spoiler, though that doesn’t stop the movie itself from eagerly spilling the beans surprisingly early, like a kid who just can’t keep a secret to himself. Even after its central revelation, though, there are welcome ambiguities that play off both a manipulation of natural sympathies for children and the darker sneaking suspicion that they could also be stone-cold sociopaths. Director Nicholas McCarthy makes effective use of everyday shadows, ginning up a few good shivers and jolts as Sarah and her husband, John (Peter Mooney), tiptoe around their low-light house. Early on, a few subtle touches—a vintage-looking Garfield drinking glass, a tape recorder, less-than-ubiquitous screens—point to a possible stealth period piece. But these details are only some odd little touches in a contemporary-set film that doesn’t sustain many of its best ideas, and eventually leans into its weaknesses. The characters tend to announce plot turns by talking to themselves. (“He wants you dead,” one character mutters to a photo, in case the audience isn’t absorbing who the killer in a horror movie wants dead.) Schilling and Mooney aren’t given much space to dig into true parental horror, and their generic reactions to Miles—anger from dad, protectiveness from mom, some bafflingly inept attempts at solutions from both—drag the movie back toward the familiar even when its actual plot holds some novelty. The filmmakers figure out how to make a creepy kid chilling again, then stop short, closing the case too early. In other words, they’ve got an underachiever on their hands.